Generously donated by Dale Earnhardt Jr. to benefit Run Freely. People: Dale Earnhardt Jr misses driving so much he’s volunteered to get behind the wheel for our veterans via Run Freely. One of you will ride next to him. He won’t be going 200 mph. It’s going to be a lawful cruise around some of Charlotte’s key car racing sites. You might get to honk the horn and control the radio. And you’ll be helping get some veterans up and moving pain-free. Click here for a look at our initial event held August 11th. Thanks for your music, Pearl Jam. On AUGust 11th we began our mission to get veterans walking again. 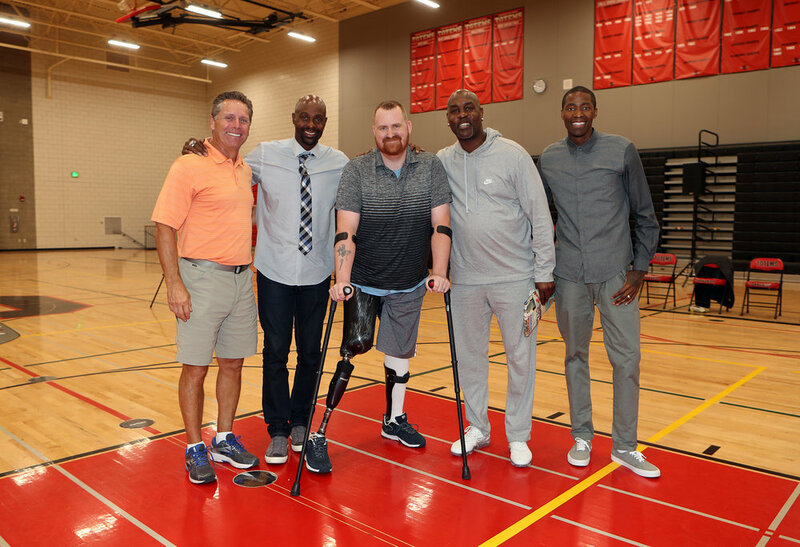 Thank you Sammamish High School & Thank you Steve Largent, Jerry Rice, Gary Payton and Jamal Crawford. this is just the beginning. JOIN US AS WE CONTINUE OUR EFFORTS. Kenny Mayne is not a veteran. He is just a sports journalist. But like many wounded veterans, he spent years unable to walk or run pain - free. The ExoSym device has helped patients with limb salvage conditions around the world. Candidates for this device complete an extensive care program that takes place in a specially designed facility located in Gig Harbor, WA.